Making bread with cheese is always a hit. When was the last time you were at a dinner party and the host put a loaf of cheese bread or cheddar biscuits on the table and you didn't immediately reach to dig in? Or at Red Lobster, don't you always end up arm wrestling your family for the last cheese bun? No...just me then.. But seriously, if you want your recipe to be a real winner, ingredients matter! Take this dough recipe. It's based on our 5-Minute Bread starter. 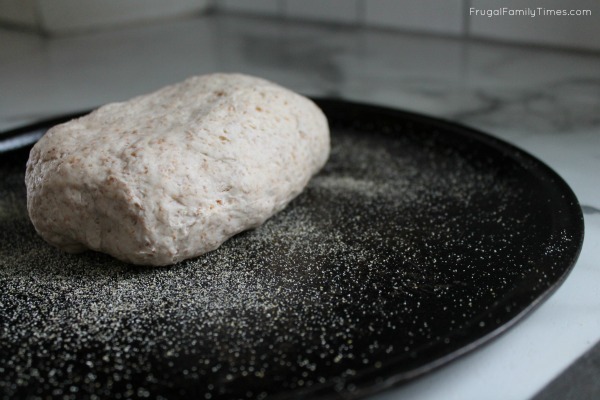 The bread ingredients themselves cost way under a dollar - you're covered there budget-wise. But, the cheese needs to be firm and flavourful - don't scrimp on it! Go to the section of the store where they sell the 'real cheese' and spend a little extra getting an ingredient that will take this recipe from good to GREAT! We had been just waiting for the right opportunity to expand our 5 Minute Dough repertoire, and when Gay Lea asked us to create something with their Ivanhoe Old Sharpe Cheddar we knew this was the time! Ivanhoe cheese is made in a hamlet we drive by often when visiting family, from milk produced by Ontario farmers. It's the oldest cheese factory of it's kind. They know what they're doing. Follow the original recipe instructions found here, but toss the grated cheese in with the flour and stir to coat before adding the wet ingredients. That's it. You have Artisan Cheese Bread Starter. Shape and Form the Loaf as described here. Score the top of your loaf with a sharp knife (in a pattern of your choosing). Top with an additional (1/4 cup) grated cheese and return to oven to bake for 5 more minutes. Remove from oven to cool for at least 15 minutes before slicing (the actual suggestion is 1 hour of cooling, but who are we kidding - you want to eat this now!). This cheese bread doesn't have big pieces of cheese jumping out at you when you cut into it. The grating means that the cheese in the dough will almost dissolve into the bread while baking. 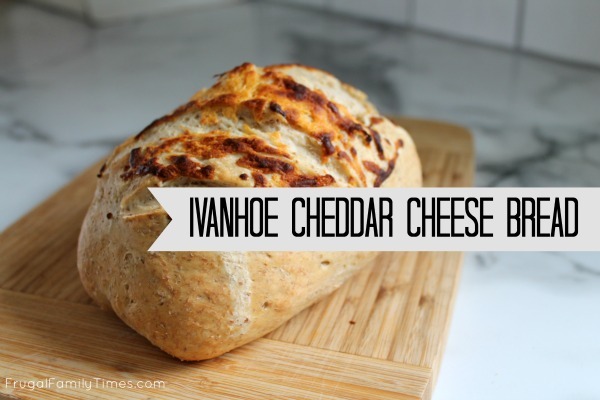 This produces an evenly flavoured cheese bread with a slight cheddar colour to it. It is heavenly with butter. For my next trick: Ivanhoe Cheddar Bacon Jalapeno Buns! Stay tuned! Hey, Ivanhoe is pretty close to my neck of the woods- we are kinda smack dab in the middle of dairy country in south-eastern ontario. Loads of small cheese makers around here plus, a creamery that I exclusively buy butter from and a dairy that I buy local milk and cream from. I'm a local food nerd so I was pretty happy when we located here. This recipes looks delish! I will have to try it. 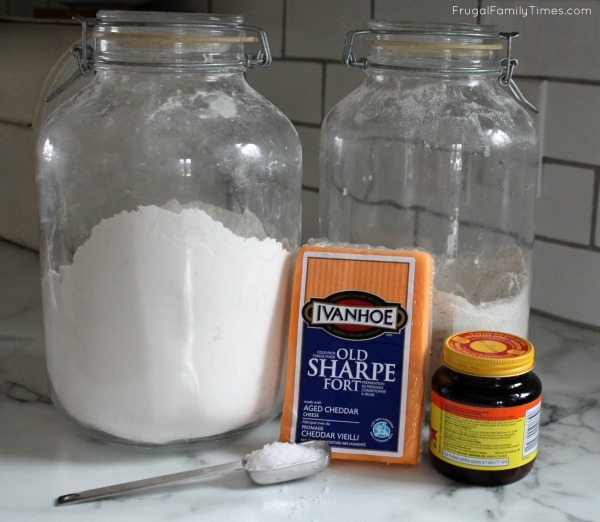 Although, Ivanhoe, why the orange colouring in your old cheddar (if you're listening)? I prefer old cheddar but I do buy old and extra old because it's usually white. (Warning: completely different tangent) I'm also curious the Stirling creamery, where I source my butter. It's been bought by Gay Lea recently and I would love to know if they still only use local dairy to produce their butter. Local food nerds unite! Yeah - I also wonder why so many places add so much orange colouring. I hope your local dairy gets to keep producing - that would be a shame otherwise.